ThemeParkMama: Don't Miss Tea Collection's Spring Fever Event: 3/13 - 3/16! 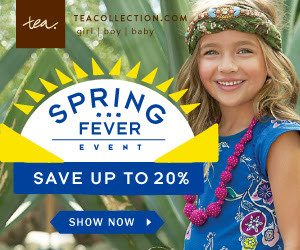 Don't Miss Tea Collection's Spring Fever Event: 3/13 - 3/16! Spring is in the air... can you feel it? Any day now, kids bitten by spring fever will shed their coats and hats, exchanging them for short sleeves and sweet dresses. Celebrate spring and the shedding of all those outer layers with Tea Collection's Spring Fever Event: 3/13 - 3/16! During the event, buy any 3 items and get 10% off, buy 4 and get 15% off, buy 5 and get 20% off! Kids will smile when they can toss the coat aside and have something bright and new to reveal underneath. You'll smile because you scored a great deal... and it's spring!